At the District Conference in Canmore our Club was awarded the 11/12 Presidential Citation - one of only six clubs in the District to receive this recognition. 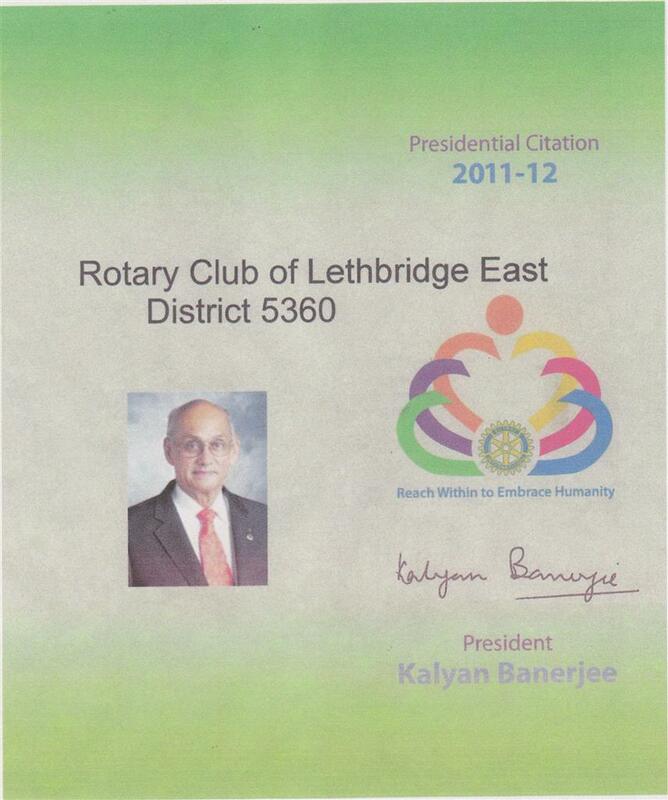 Every year the criteria for the award are set by the current Rotary International president. 11/12 President Kalyan Banerjee focussed on membership growth with emphasis on increasing the number of women in Rotary. Globally, Rotary International still has fewer women than men, but in most Western nations there is a noticeable shift. The other main focus was on contibutions to The Rotary Foundation and its Annual Program Fund. Contributions in this Fund become available in three years to the Rotary Districts, then providing a valuable source for Grant moneys issued by the Districts to Clubs applying to match these funds for their International or Community Service projects. We are proud of this achievement, our Grant Applications are fruitful, and the Community benefits !